FILE - Malaysian Prime Minister Mahathir Mohamad, center, waves to crowds leaving National Mosque after Friday prayers in Kuala Lumpur, Malaysia, May 11, 2018. Malaysia and China are looking to re-balance ties as the new government of Prime Minister Mahathir Mohammad seeks to renegotiate billions of dollars of Chinese backed infrastructure spending, with the goal of reducing the country's national debt. China is Malaysia's leading foreign direct investor at over $3.38 billion, ahead of the U.S., Japan and Singapore, with major infrastructure deals negotiated during the previous government of Najib Razak. Carl Thayer, a professor of politics at Australia's University of New South Wales, says Malaysia is seeking to move beyond anti-Chinese rhetoric that had been an undercurrent of the May 9 national polls. "But Prime Minister Mahathir since the election has basically declared that the existing agreements will stand — that's with any country. But there will be a review of these agreements with China. And the key project there seems to be the east coast rail line which is seen as a 'white elephant', costing a lot of money and not really delivering," he said. 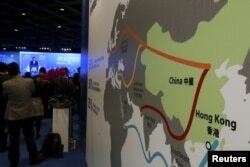 FILE - A map illustrating China's silk road economic belt and the 21st century maritime silk road, or the so-called "One Belt, One Road" megaproject, is displayed at the Asian Financial Forum in Hong Kong, China Jan. 18, 2016. The East Coast Rail line is a key portion of Beijing's Belt and Road initiative (BRI) infrastructure into South East Asia covering 688 kilometers connecting the South China Sea with the Thai Border. "We need to find out what benefit there is to us. To find out firstly the train is not going to be viable; secondly, its not benefiting Malaysia as much as we would like to see," Mahthir told VOA. "We don't want to have a huge number of immigrants in Malaysia. Some of the Chinese companies have done that; that is not foreign direct investment," he said. "I think we will be able to convince [China] that some restructuring of the terms of the borrowing and the projects and all that will have to be done in order to reduce spending, in order to reduce the loans that we took from foreign countries," Mahathir said. But Mahathir said this project "would be dropped" as it was unnecessary" and would "not earn a single cent." University of New South Wales' Thayer expects China will be pragmatic in dealings with the new government. "It's got massive investments in Malaysia it would want to protect. China would roll with the punches and take the long view. Eventually that Malaysia — as I indicated — all the fundamentals are there to continue the relationship." "Trade is managed in Malaysia's favor; substantial growing Chinese investment building infrastructure projects, some of which are needed, others maybe excessive, renewing, renegotiating the balance in that relationship, but not lurching to the U.S. camp," Thayer said. 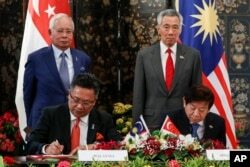 FILE - Malaysia's then-Prime Minister Najib Razak, and Singapore's PM Lee Hsien Loong witness the signing of an agreement on the Johor Bahru-Singapore Rapid Transit System Link at the Istana or presidential palace in Singapore, Jan. 16, 2018. Both Mahathir and wealthy Malaysian businessman Robert Kouk, who sits on a powerful advisory panel to the Malaysian government, recently met China's ambassador to Malaysia, Bai Tian. Mahathir later said Malaysia's "strong ties with China will continue to flourish." James Chin, director of the South East Asia Institute at the University of Tasmania, says China's Malaysian investments are also key to China's regional strategic goals. "Part of the reason China is such a big player in Malaysia is due to the geopolitical realities facing China. People do not realize that Malaysia is the only country in South East Asia that surrounds the South China Sea," Chin said. "China is the regional global power in terms of economic issues, especially in South East Asia, and it is going to play a very big role and Malaysia is looking for new economic drivers," Walsh said. Walsh said outside infrastructure projects, China will look to other economic areas to continue a role in Malaysia's economy. "And I think there are people in the system that understand that," she said. David Boyle contributed to this report.